Rotary Club of Blackpool South - Welcome! To see our new video just click BLACKPOOL SOUTH ROTARY IN ACTION DURING 2017 Get a snapshot of what we did in 2017. To accompany the visuals you can listen to Peter Jebson playing 'I do like to be beside the Seaside' on the Mighty Tower Ballroom Wurlitzer . Honorary Member and Rotary Town Crier Barry McQueen sings 'Doing it the Blackpool Way', followed by his rendition of ‘My Little Ukulele’ from George Formby’s1935 film ‘Off the Dole’. We are proud to be a Rotary Club in Blackpool, arguably Britain’s Premier Seaside Resort. Blackpool Tower is a welcome sight to those coming to Blackpool and promises a warm welcome to all. You will also find a warm welcome at Blackpool South Rotary Club. We are a small, happy and friendly club. As Larry Page, Co-Founder of Google said, " Small groups of people can have a really huge impact". If you wish to make an enquiry about joining Rotary you can click on 'Contact us' on the top of this Home Page and complete the e-mail form. We will then get in touch with you. Trevor Bennett joined Blackpool South Rotary Club in 2012. He was a very committed Rotarian and enjoyed giving service to others. 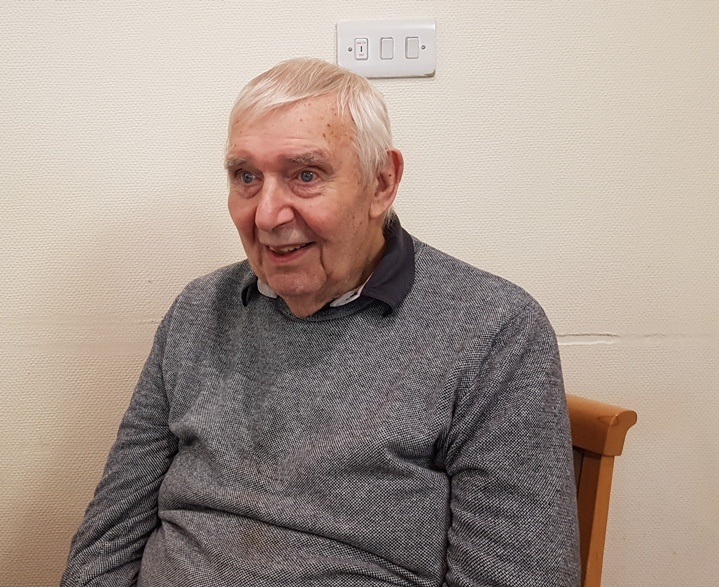 One duty he particularly enjoyed was as a reader for the Talking Newspaper Service for N Vision, The Blackpool and Fylde & Wyre Society for the Blind. In 2014 he received the prestigious Stanley Parr Silver Salver which is awarded annually to a Rotary club member who had given outstanding service to the Club and Rotary and made a significant contribution to the well-being of the Club. Trevor was a very worthy winner. Volunteering was in Trevor’s blood and he also became a volunteer for the Wyre Countryside Service. He spent many hours helping to look after Wyre’s coast and countryside. In addition he often did spells showing the public around the National Coastwatch Institution’s Rossall Point Station. Watchkeepers are the eyes and ears along the coast. Sadly, Trevor died in August 2017 from a respiratory disease. He was a highly regarded and much loved Rotarian and friend. Blackpool South Rotarians decided that his memory should be commemorated to reflect the great service Trevor had given to Rotary International and the wider community. Trevor was respected by his Wyre Countryside Ranger colleagues and his friends at Rossall Point Station. Discussions were held with the Council and the Wyre Rangers. It was decided that his Rotary colleagues with provide a suitably worded plaque and the Wyre Countryside Rangers would attach the plaque to a sturdy wooden post and it would be situated in front of a seven year old oak tree, Trevor’s favourite tree in the Wyre Estuary Country Park where Trevor spent much of his volunteering time. On the morning of Saturday 3rd November, Trevor’s family, Rotary colleagues and Wyre Countryside Rangers and other volunteers gathered to pay their respects to this gentle and caring man and to see the unveiling of Trevor’s plaque. Unfortunately, work commitments prevented his younger son Ian from attending the ceremony. Blackpool South Rotary President Pat McCarthy spoke first at the ceremony, followed by close friend Ron Greenhough and Alison Boden, Coast and Countryside Manager spoke about Trevor's involvement. Trevor’s eldest son Simon thanked everyone for attending which he felt reflected the respect and friendship for his father. Although the ceremony was short and informal, it was felt that knowing Trevor’s feelings about such things, that this was the best way to honour his memory. Trevor was truly a man of honour. Don't forget to go to Photo Galleries to watch the slide show. Blackpool South Rotary Club celebrated its 66th Charter Dinner. This special event took place on the evening of Friday 2nd November 2018 at Blackpool Park Golf Club. We were privileged to have as our Chief Guest, District Governor Mary Bradley who was accompanied by her husband David. In responding to the Toast to Blackpool South Rotary Club, the District Governor made some very complementary comments about our Club quoting Larry Page, Co-Founder of Google who said, " Small groups of people can have a really huge impact". Mary also revealed that she had done considerable research about Blackpool and its past. This was quite relevant as our guest speaker Alan Bane's subject, was “You’ve never had it so good”, a reference to Prime Minister Harold Macmillan’s famous speech. However, Alan covered more than politics e.g. adverts, seaside posters, pop music, etc. He used videos with sound and his choice of music was from 1957 and 1958. Many joined singing well loved songs. It was an excellent presentation which was well received and he had the attention of the audience throughout. Alan was donating his fee to Trinity Hospice. It was a very enjoyable evening to celebrate the club’s 66thbirthday. Above: The Top Table and President's personal guests. To view the slide show, go the menu (top left side of the Home Page). Click on Photo Galleries and you will see the Charter Night 2018 page. When you click on the page, the photos will appear as a collage. All you have to do to access the slide show is to click on the first picture and that will take you into the carousel when you can view the slide show by clicking the arrows on each side. Any problems contact Jeff Meadows. We would like to express our thanks to our photographer Peter Westhorpe. 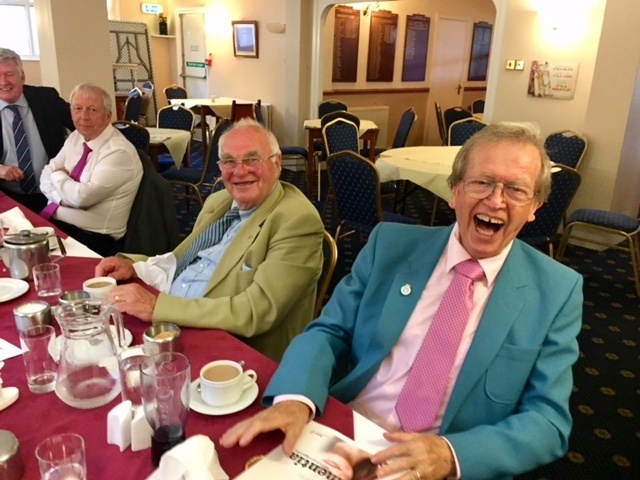 Members and guests at Blackpool South had their own Trafalgar Night on Monday 15th October. There was a transformation of the Club and of those present for one night. In addressing members and guests and much to their amusement, Commander Pat McCarthy RN, the President of the Club said that he had obtained the Commander-in-Chief Fleet’s permission (CINCFLEET) to commission Blackpool South Rotary Club as ‘HMS Blackpool South’ for the night and appoint members to various roles to man the ship. Unfortunately, all the guests were pressed ganged! Also present was Surgeon Commander Steve Mannion RN, who bore a striking resemblance to Top Trauma and Orthopaedic Surgeon Steve Mannion! Commander McCarthy looked resplendent in his dress uniform complete with sword and he gave a most interesting and informative talk about Nelson, his early life and of course, his resounding victory at Trafalgar. Above: Pat shows off his ceremonial sword. Above: A young Pat McCarthy. Above: Another handsome naval officer - a young Steve Mannion. To read more about Dr Tirou's visit and to see more photos, click on the menu on the top left hand side of the Home Page then click on 'Photo Galleries'. Thanks to Peter Westhorpe for the photographs. Our well respected member Jacqui Longden is due to undergo heart surgery at Lancashire Cardiac Centre, Blackpool Victoria Hospital on the 26th September 2018. We all wish her well and look forward to her return to the Club when she has recovered and is back to full health. Our picture below shows Jacqui getting a special hug from our Honorary Member Tony Jo. Tony certainly made Jacqui’s visit to the club very entertaining and she laughed much during the evening. UPDATE - 3rd OCTOBER 2018: Jacqui's surgery went well and she is now at home recuperating. As you all will appreciate she needs plenty of rest and we look forward to Jacqui being fit enough to vist her Rotary Club again when she is fully recovered from this major surgery. Anyone involved in outside charity collections knows that it can be quite demanding, particularly when collecting in cold or inclement weather. So Blackpool South Rotary Club is very fortunate to have the services of our silent fundraiser, who without complaint is on duty 24 hours a day for 365 days a year in all weathers. It is of course, our Wishing Well which is situated on South Promenade outside the Blackpool Pleasure Beach. The Wishing Well was constructed on the Pleasure Beach Forecourt and when new was launched by the late Mrs Doris Thompson, chairman of Blackpool Pleasure Beach. We at Blackpool South Rotary are so grateful to Blackpool Pleasure Beach Ltd for their support and for their help in maintaining the well. It is a wonderful example of this well respected Blackpool Company working with the local Rotary Club to raise funds for some very worthy local causes. 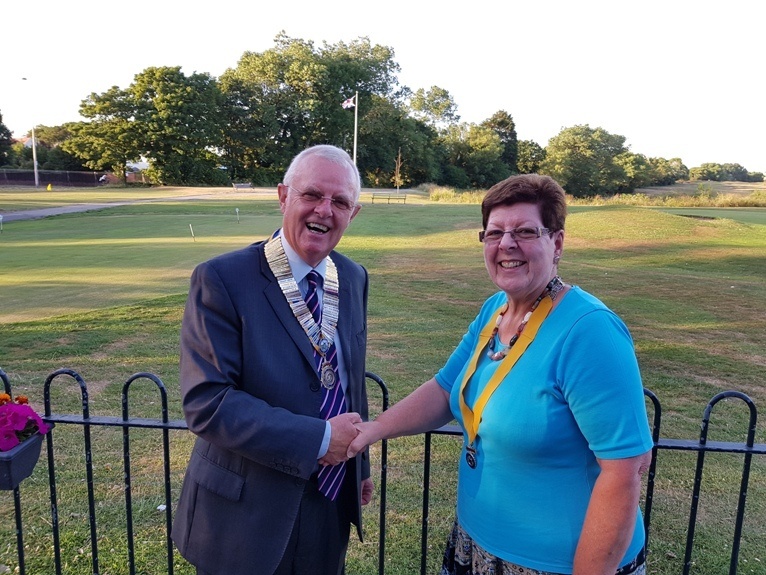 Blackpool South Rotary Members gathered on the evening of the 20th August to wish Darling Elaine Fossett good fortune as she leaves the Red Rose County and relocates to the White Rose County. Elaine has been a committed Rotarian since 2005 and will be missed. There was much hilarity on the night and Elaine will be most welcome when she visits us in the future. Above: Darling Elaine got a great send-off. Kathy & Jeff Meadows and Rose and Harry Beard called on longtime member (now Honorary Member) Bill Scarfe today (20th August). Bill is a resident at Fleetwood Hall Care Home, Chatsworth Avenue, Fleetwood FY7 8RW; Phone Number 01253 777065. Bill was pleased to see his old friends and we had a pleasant chat. Bill sent his very best wishes to his friends at Blackpool South Rotary Club. Blackpool Armed Forces Week between the 25th June and the 1st July rightly paid tribute to the men and women of our Armed Forces, past and present. Our military personnel have given great service for their country and should be honoured. As the Armed Forces Week drew to a close, two former Royal Navy Veterans were stepping up to give yet more service to their community. 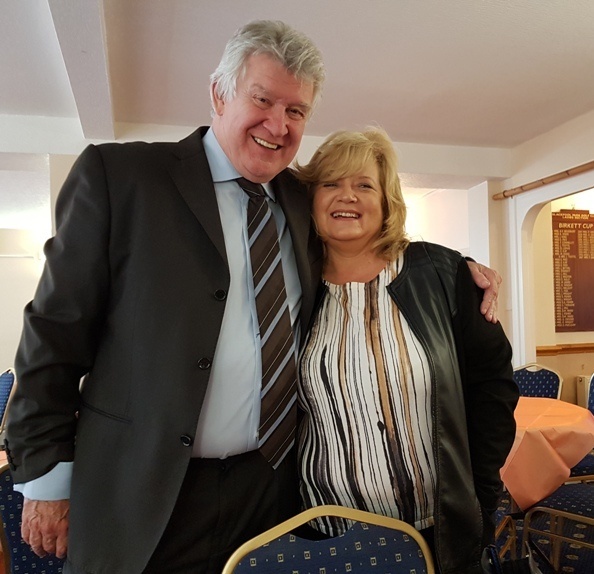 On the 1st July, Pat McCarthy became President of Blackpool South Rotary Club and his wife Lesley; became the Club’s President elect. Pat joined the Royal Navy October 1971 and served in HMS Kent, HMS Matapan and the guided missile destroyer HMS Devonshire. 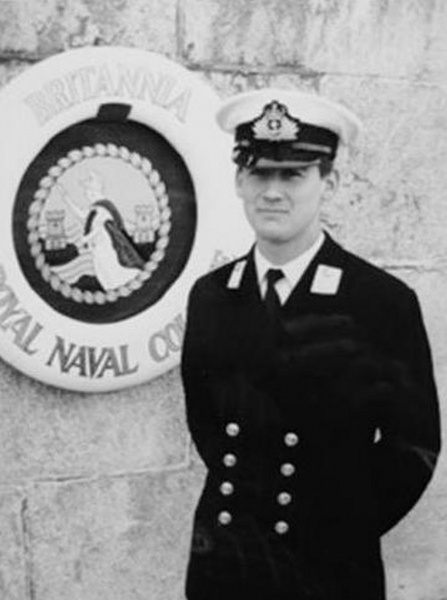 Following his advancement to Petty Officer, Pat served in the frigate HMS Aurora before attending Britannia Royal Naval College in Dartmouth in 1979. 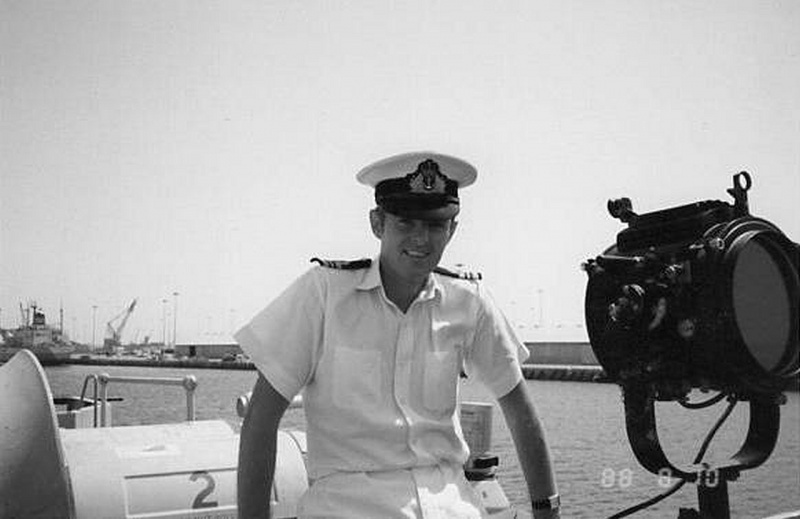 As an officer Pat served in the frigates HMS Jupiter and HMS Charybdis and the aircraft carrier HMS Invincible. Pat served in a number of shore appointments including HMS Collingwood as the Supply Officer and the Ministry of Defence as the Assistant Secretary to the Second Sea Lord. Pat's final appointment was as the Command Supply Officer to the Second Sea Lord retiring in 2001 and moving to the Fylde Coast to take up the position of Bursar at Arnold School. Lesley joined the WRNS at HMS Dauntless in June 1972 and served in a number of shore appointments in the Portsmouth area including HMS Victory, Secretary to the Matron at the Royal Naval Hospital Haslar and in a variety of roles in HMS Nelson including as the Secretary to the RC Chaplain, Secretary in the RN Divisional School and Secretary to the Base Supply Officer. Lesley retired in 1974 following her marriage to Pat and to bring up their family. In later life she was a college lecturer. In addressing Club Members and Guests, Pat said that he was privileged to lead this small, friendly and happy club. All members pulled together and worked hard to support Rotary’s guiding principle “Service before Self”. He felt sure that Blackpool South members would continue to give good service in the coming year both locally and internationally. To see what we Rotarians do click on BLACKPOOL SOUTH ROTARY IN ACTION DURING 2017 in first paragraph of this home page. Above: Outgoing president Eric Hind congratulates President Pat. Above: President Pat welcomes his wife Lesley as his President Elect. 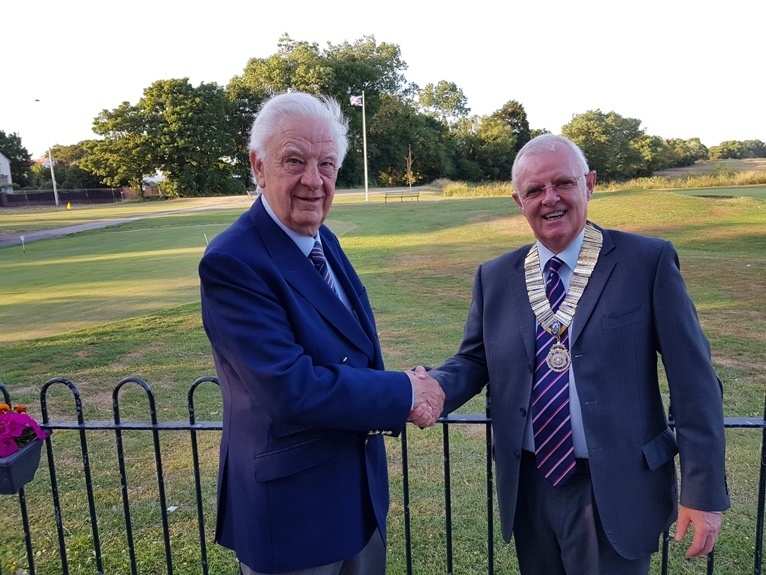 On the evening of the 11th June, Blackpool South Rotary President Eric Hind hosted an evening in Partnership with the Superintendent Gerry Richardson Trust at Blackpool Park Golf Club. 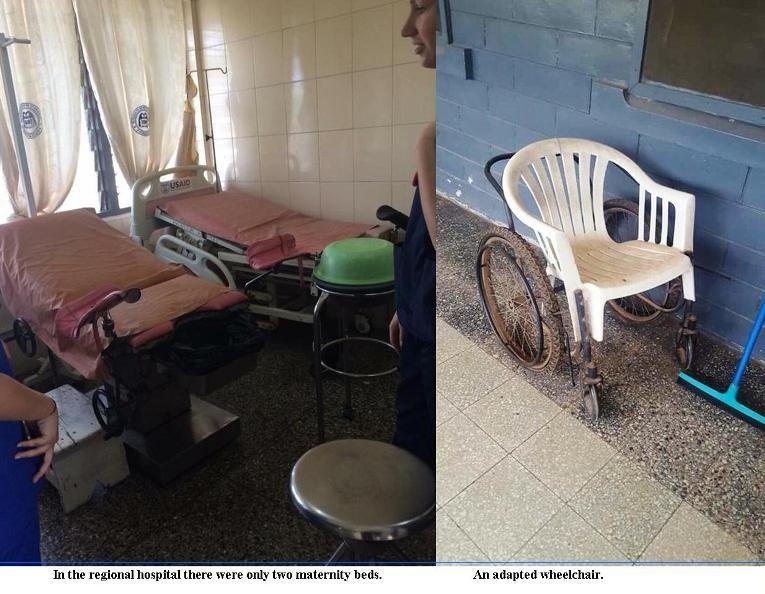 Courtney Sandham and Emily Lancashire, former Highfield students are second year trainee nurses and recently spent three weeks in Ghana, Africa on work experience. The girls funded their own trip supported by their family, using their savings and by working at Dunhelm, Blackpool in the coffee shop and on the shop floor, when their studies permitted. They also took on additional jobs and received a £320 grant from their university UCLAN. Jeff Meadows who is also a trustee of the Gerry Richardson Trust, learned that they needed money for their final vaccinations. He liaised with his Trust colleagues and Emily and Courtney each received a grant of £250 to enable them to complete their arrangements for their trip. The girls were so appreciative and volunteered to give a presentation on their return. Their presentation was well attended and members and guests enjoyed a delicious three course meal before the girls gave a well prepared illustrated presentation about their experiences in Ghana. The audience saw two trainee nurses who really cared about the adults, children and infants they treated in Ghana and who experienced firsthand how the medics there managed with such very basic equipment, beds, wheelchairs (they had to adapt a plastic chair with wheels) and drugs to treat patients. There was no doubt that these two very special young nurses were deeply affected by their experience which was so worthwhile. What was special for the girls on the night was that they were able to meet Blackpool South Member, Superdoc orthopaedic and trauma surgeon Steve Mannion and his guest, Orthopaedic Clinical Officer Sandy Chimangeni from Malawi who was on a trip to the UK. Steve was described by the BBC as “The Indiana Jones of Surgery”. To round off the evening, Blackpool South Honorary Member and Patron of the Gerry Richardson Trust, Comedian Tony Jo performed a very funny comedy spot. There was continual laughter during his performance and he sent people home with smiles on their faces. Above: Emily Lancashire and Courtney Sandham with top orthopaedic and trauma surgeon Steve Mannion. Above:(L-R) Past President Jeff Meadows. Emily, Courtney and President Eric Hind. The elephant in the slide appeared outside the girls' accommodation block one morning. Above: Steve Mannion, Emily, Sandy Chimangeni, Courtney and President Eric. Seated is Tony Jo. 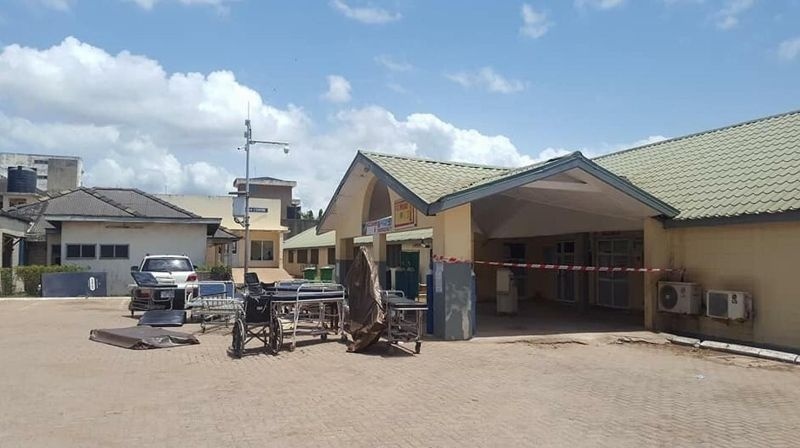 Above; This was the regional hospital's A & E Department. Photographs provided by Courtney and Emily. The Superintendent Gerald Richardson Memorial Youth Trust was set up in 1974 by members of Blackpool North Rotary Club in memory of their member Superintendent Gerry Richardson, who was tragically murdered by armed robbers in Blackpool on the 23rd August 1971. The Trust has to date supported over 17,000 young people, 25 years and under and given grants totalling over £280.000. Since Blackpool North Rotary Club ceased to exist, other Rotarians and supporters have kept the Trust going. Two members of Blackpool South Rotary are Trustees and one is a Patron. Every year the Trust organises a Music Festival for children from the six Special Schools in Wyre, Blackpool and Fylde Boroughs. Ribby Hall Village very kindly allow us to use their splendid facilities and Harry Ramsden provides every child with a 'goody bag'. 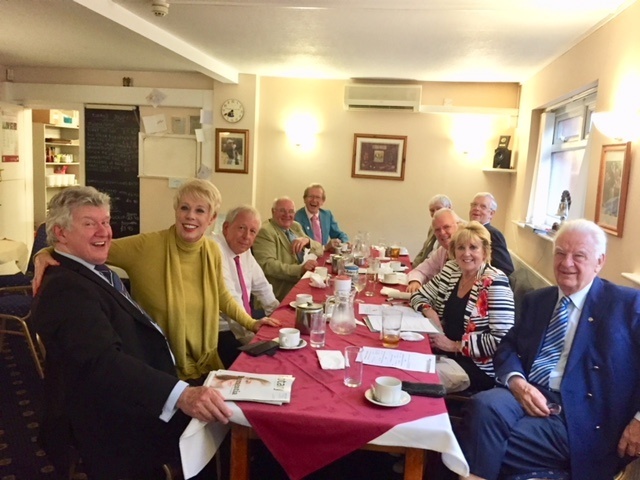 It is a joyous occasion attended by the Mayoral Parties from all three Boroughs and Rotary District 1190 (Lancashire & Cumbria) District Governor. Gerry who was passionate about youth work would have been so proud. Above: (L-R) Cyril Squirrel, President Diane of Blackpool Palatine Rotary Club (who was presenting a cheque for £250 to Gerry's widow, Maureen), Jeff Meadows (Trust Chairman) Mrs Maureen Richardson, Blackpool & Rotary Town Crier Barry McQueen and Dizzy Duck. Highfield Leadership Academy once again demonstrated that they have some very good young artists. Students entered the 2017/ 2018 Rotary Young Artist, the subject being ‘A Different Perspective’. Club members decided to award two joint first places in the Senior Category (Year11) and three joint first places in the Intermediate category (Year8). 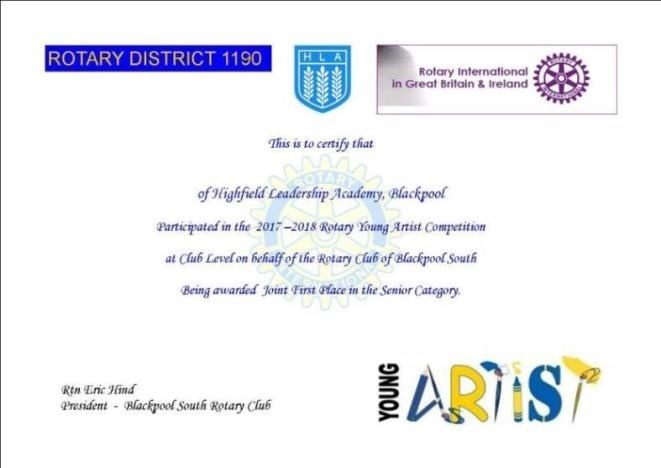 Each winner was presented with a Blackpool South Rotary Club Young Artist Certificate and received a £25 iTunes Gift Card. 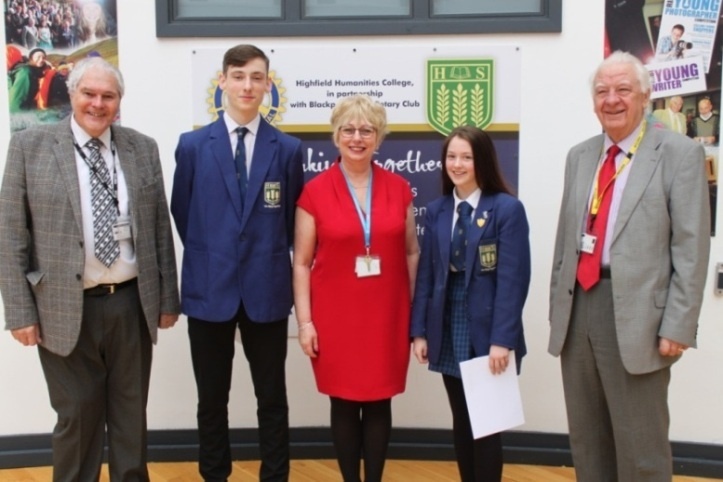 President Eric Hind and Past President Jeff Meadows attended the Year 11 Assembly on Monday 16th April and Year 8 Assembly on Thursday 19th April when President Eric presented the winning students with their certificates and Gift Cards. Executive Principal Mrs Helen Mackenzie OBE attended both assemblies and was joined by Mr Paul Fearnley, Chair of Governors at the Year 8 Assembly. Above (L-R): Past President Jeff Meadows, Mrs Helen Mackenzie OBE, President Eric Hind and Mr Paul Fearnley with the winning students. Above: (L-R): Past President Jeff Meadows, Mrs Helen Mackenzie OBE, President Eric Hind with the winning students. Above: An example of the certificate awarded to students. President Eric had a very pleasant duty on Monday 27thFebruary when he inducted Peter Westhorpe into Honorary Membership of Blackpool South Rotary Club. Peter was accompanied by his wife Liz. 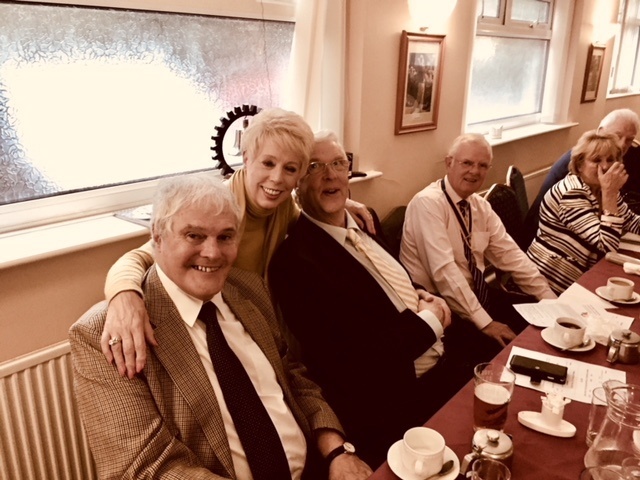 Members decided to invite Peter to join the Club as an Honorary Member because of the great support he has given to Blackpool South Rotary. He joined Highfield High School (now Highfield Leadership Academy) as a young science teacher on completing his university degree at Bangor University. Throughout the years promotion came and in 2008 he was appointed First Deputy Headteacher with various spells as Acting Headteacher. Peter was instrumental in creating the excellent working relationship between his school and Blackpool South Rotary, encouraging his students to participate in Rotary sponsored projects. He was very much involved in the design of the new building which opened in Sepetmber 2012 and was responsible for creating the Rotary Wall in the main entrance of the splendid new school. Since his retirement in 2015 he has supported Blackpool South Rotary as a photographer at Club events and has been a willing helper with our Christmas collections. For the last 10 years, he has been a Vice President of Lancashire Outward Bound Association. He is Trustee, Treasurer and Protocol Officer of Blackpool Windmill Youth Group. Peter more than qualifies for his honorary membership. After his induction, he thanked members and he said he was honoured to join our small and friendly club; a club which he said ‘punched above their weight’. Above: President Eric (left) congratulating Peter. 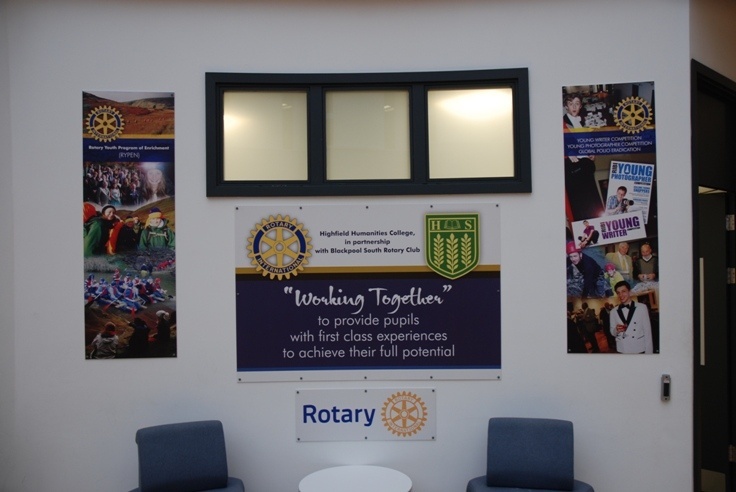 Above: The Rotary wall at Highfield leadership Academy created by Peter Westhorpe when he was Deputy Headteacher. This is a unique tribute to Highfield and Blackpool South Rotary 'Working Together'.